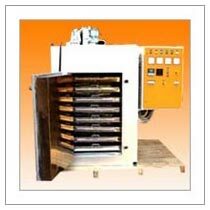 We are instrumental in manufacturing, exporting and supplying of Tray Oven. We have been catering to the requirements of various industries by offering highly efficient and durable Tray Oven; available at the most competitive prices. We have excellent production facilities; we have also adopted cutting edge technology for the precise and fast production of Tray Oven. The Tray Oven we fabricate is tested by the industrious team members; thus ensuring durability and performance. Tray oven are basically enclosed insulated chambers in which trays are placed. Here heat is transferred by the circulation of hot air that is produced by the electric heaters or any other heating media. The designing parts of these ovens are done by industrial professionals and ensure excellence. Horizontal air flow above the trays give uniform heating to the charge. Further blower fans are also added to ensure proper circulation and transfer of heat. These dryers are used in diverse applications as in electrodes, powders, chemicals, etc. These ovens have temperature capacity up to 450 Degree Celsius. Oven is provided with Rockwool Slab or ceramic fibre insulation.